We often have stew for dinner in the winter. Veronica stewed the beef in red wine. The guests were late and James was stewing about it. Kate is in a stew about her exam. The modern meanings of stew come from a now archaic sense meaning ‘a heated room,’ which was a figurative sense of the original meaning, ‘a pot for cooking.’ By extension, a stew was a heated room where people took hot air or vapor baths. As prostitutes often plied their trade in the public baths, stew also came to mean ‘a brothel’ or, often in the plural, ‘a neighborhood occupied by brothels.’ You won’t hear it used like that now, but you might come across it in older books. If you’d like to try making a stew yourself, click here for a recipe for a classic Irish stew. If you’d prefer a vegetarian option, you could try this vegetable stew with herb dumplings. 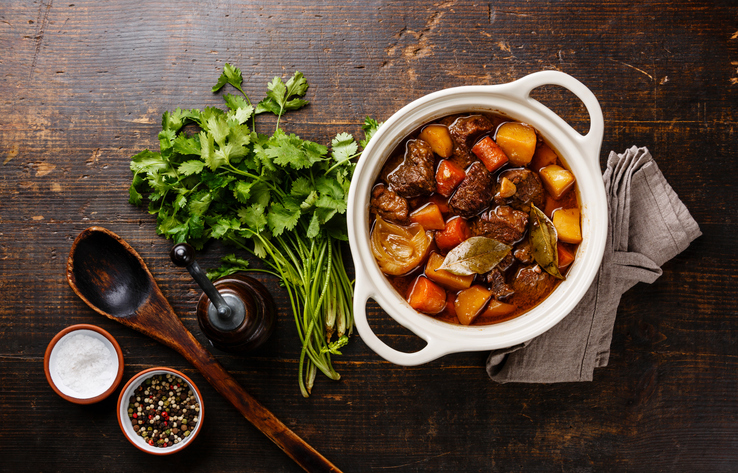 Stew, as both a verb and a noun, date back to the early to mid-14th century. They came into English from the Middle French verb estuver, which could mean ‘to take a hot bath’ as well as ‘to stew’ (food). Its origin is uncertain, but most linguists think it can be traced back to the Medieval Latin stupha, from the Vulgar Latin exsuphare (to evaporate), made up of the prefix ex (out) and tufus (vapor or steam). The latter can be traced back to the Greek typhos (smoke). It is related to many Romance language words, such as the French étuver, the Spanish estufar and estufa and the Italian stufare, as well as the English word stove. In English, the first recorded sense of the noun stew, meaning ‘a vessel for cooking,’ appears before the verb, but it’s possible the verb was already in use, and simply not recorded or lost. By the mid-14th century, however, both the verb (in its Middle English form stewen or stuwen), meaning ‘to take a hot bath,’ ‘to take a sweat bath’ and ‘to stew’ and the noun, with the aforementioned meaning and ‘hot room for bathing’ were common. By the late 14th century, stew had also become slang for a brothel and, in its plural form, a neighborhood occupied by brothels. This figurative use also existed in French, and was probably carried over with the word. The senses related to bathing and steam baths (as well as prostitution) slowly fell out of use as the cooking senses expanded. By the early 15th century, the verb was commonly used for ‘to boil slowly’ or ‘to cook meat by simmering in liquid,’ and by the mid-18th century, the main meaning of the noun had become ‘meat cooked with vegetables.’ The figurative sense ‘to worry or be agitated’ (and its accompanying noun sense both date back to the mid-17th century, and are figurative takes of the cooking sense.